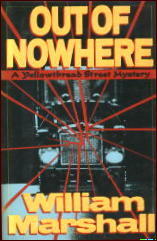 » Reviewed by Allen J. Hubin: WILLIAM MARSHALL – Out of Nowhere. Reviewed by Allen J. Hubin: WILLIAM MARSHALL – Out of Nowhere. WILLIAM MARSHALL – Out of Nowhere. Mysterious Press, hardcover, 1988; reprint paperback, 1989. The thirteenth mad adventure from Hong Kong’s Yellowthread Street Station is Out of Nowhere, by William Marshall. Here as usual Inspector Harry Feiffer and his minions have several wacky puzzles. There is the matter of the rented van, loaded with second-quality plate glass and carrying four persons, which vehicle roars the wrong way down a 3 A.M. freeway for a spectacular collision with a truck. Everything Harry learns about this matter serves to increase his bafflement. Meanwhile, there’s the Dalmatian which repeatedly attacks an herbal medicine shop, wrecking the premises (mighty dog!) and carrying off selected medications as well as an array of wind chimes. And finally, Inspector O’Yee, manning a line designed for the pacification of telephonically inclined psychopaths, finds he has a ten-year-old child on the other end with a loaded and cocked Luger in his school bag. Marshall stirs this mix in his typical onomatopoeic fashion. Enjoyable but not the strongest in the series. Vol. 11, No. 3, Summer 1989. Note: There was also a Yellowthread Street television series in England. Produced by Yorkshire Television, it ran for one season (13 episodes) in 1990. It has not yet been released commercially, but DVDs can be obtained on the collector-to-collector market. Another series that I’ve never read a single one of, alas, although I’ve always meant to. And obtaining a set of DVDs sounds tempting, too, but I think it’s one of those things I need to think about first, preferably overnight. Great or minor, Yellowthread Street was an address I was always anxious to visit. Marshall also did a historical tec series that was good, but nowhere near as much fun as these. I’ll have to look into those DVD’s, this was simply one of my favorite series of its time. This was the exact point in the series where I stopped. At least twice I’ve tried to get through this book without success. This was one of my favorite book series from the time and near top on my list of waiting to come to e-books. I have a copy of “New York Detective” but have yet to read it. That series was a police procedural set in New York in 1883. I have seen clips of the TV series on YouTube and was disappointed, but not enough not to want to see a full episode. I can contribute something to talk of William Marshall and his ‘YellowThread Street’ series. One of his titles in particular, ‘Roadshow’ I found analyzed deeply in the pages of a work of published literary criticism. Pretty surprising! “Chaos and Order: Complex Dynamics in Literature and Science” –edited by Katherine N. Hayles– is an anthology of challenging essays on the theme of chaos theory in literature. 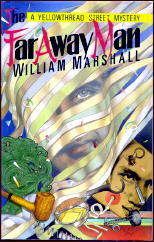 Apparently, some-or-other academic type featured in this compendium had discovered hidden oddities in Marshall’s technique for the writing of ‘Roadshow’. It has something to do not only with the plot of the book (which involves thieves creating ‘gridlock’ in the streets of Hong Kong to help them carry out their theft) but also with the structure of the narrative itself. They single out this innocuous little mystery as somehow illuminating principles of indetermination. At the start of the essay, the author even recommends reading his thesis *in conjunction with* Marshall’s title, in a back-and-forth manner, to see these strange patterns revealed. Very interesting experiment! I found it very rewarding; and it is something I’ve never seen done elsewhere. A rich piece of analysis and dissection like this is rarely conducted on a work of mystery or detective entertainment…highly rewarding. I don’t know if I’ll go looking for Hayles’ book, but the article sounds very interesting. Thanks, Feliks, for the write-up about it.